The product quality of many manufacturing processes often depends on the products water content since this is typically the bottleneck of the production process. It is imperative that the factory utilizes an on-line moisture analyzer to monitor the drying conditions. This would assure maximum product flow rates, reduced lab work, lower production costs, less rework, and optimal gas or electricity usage. Too much or too little water, in some cases, would influence powder flow, compaction, dissolve rates, and particle structure and stability. Moisture can also influence the chemical and physical properties of individual active ingredients. It is also important to be able to measure the products moisture content without contact with the measuring sensor and for the measurement to be independent of material characteristics such as particle size, shape, color, temperature, density, or distance to the sensor. The Finna Group Model SMART III NIR on-line moisture analyzer meets all of these requirements and more. 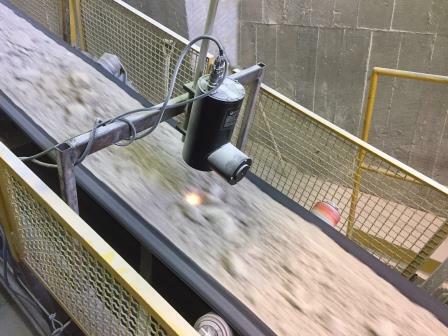 With the SMART III, each manufacturing process can be accommodated: belt, screw, vibratory, bucket, chutes, and pneumatic conveying systems are all subject to on line NIR moisture measurement. Output control signals are a standard feature that permits the plant’s PLC or DCS to accept the meters output signal and adjust the product flow rates, dryer temperatures, dampeners, etc., to achieve optimal and continuous targeted moisture levels.